Now, you may or may not know this about me, but I absolutely love denim. Especially when Summer rolls around! Denim shorts, denim dresses, denim skirts, denim jackets, denim handbags, denim shoes and of course a trusty pair of jeans. I feel like denim is one fashion trend that the world will never get sick of and thankfully, neither will I. Just as well as this trend just seems to come around over and over again. Who remembers these moments in denim history. These stars were all about the all denim life. Beyonce, Britney and Justin, TLC and B*witched. They were all for it! I'm not sure that I love denim quite that much but I do love it! Firstly, on my hunt for sustainable denim brands, I came across this Wales based brand, Hiut. They design jeans for both men and women which are created using organic cotton. I love their transparency and passion for the environment. Check out their website here for details on how they are working to cut down the amount of water and CO2 used to produce this fashion staple. For dresses, I definitely didn't struggle and I spied a couple of brands that I could really get behind. The first one was Arlo who make gorgeous dresses like this one on the Komodo website where you can find bamboo dresses, vegan shoes, socks, bags and jeans for men and women. I also found this gorge little shirt dress from Thought. 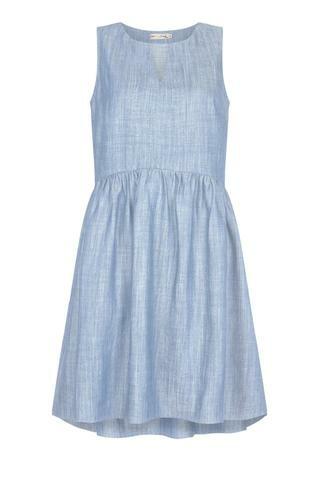 Also made from Tencel, this dress is great for those long Summer commutes and day's in the office. Paired with some sliders, this is also a great every day casual dress and it's thin but high quality Tencel is spot on for this scorcher of a British Summer. Now for those that know me, know how much I love my shoes. So I was elated to find a few pairs of gorgeous denim shoes to complete my denim obsession. Firstly, these Ethletic loafers are great for a chilled day on a yacht or for walking around in the sun. And I also spotted these Stella McCartney funky starry wedge with this chunky saw-edge sole. These will add some sauce to any outfit. I also love this edgy jumpsuit which is a chic twist on the denim concept.